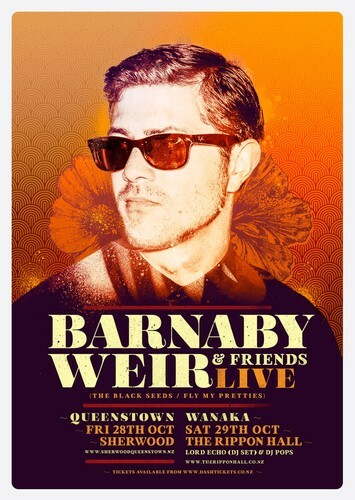 Barnaby Weir & Friends (The Black Seeds/Fly My Pretties). Barnaby Weir & Friends will be performing live songs from their vast back catalogue of classic material. Add to this the beautiful surroundings of the famous Rippon winery and Very special guests DJ's Lord Echo and DJ Pops and you have the Spring festival not to be missed! Hot off the back of the popular Fly My Pretties 'String Theory Tour' and straight out of the studio Barnaby Weir continues the flow with a special two date weekend in the Deep South. Barnaby recently produced the debut 'tunes of i'Album, guested on the new Bolt42 release 'Nights in Earth' and just completed numerous sessions in the studio on the forthcoming Black Seeds 6th studio album. He was recently in Wanaka as a mentor in the Yami music project and was appointed as an ambassador of the Te Auaha New Zealand Institute of Applied Creativity which is currently under construction in Wellington and scheduled to open in 2018. Barnaby Weir & Friend can't wait to hit Wanaka with a stack of new and well-known tunes for your entertainment.